Welcome to the Getting Started Guide. 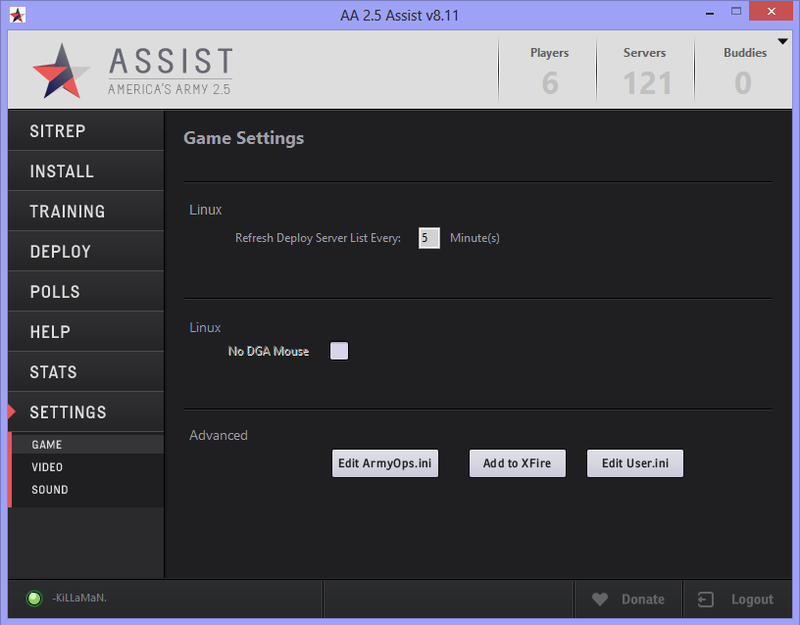 This is where you'll find how to install and start playing Assist, along with tips for improving your skills. If your looking for something that isn't in the getting started guide, try searching the forum, or check out the support page. The following videos will cover downloading Assist, installing, and answering a few of the commonly asked questions pertainting to install locations, and start up errors. Learn Tips and Tricks on different maps from some of the community pros. Be sure to stop by the Tactics Forum Board and share what you know and help other players grow. Once you've found a location to place your files, start Assist. You will be using the 2.5Assist executable to play America's Army, so don't forget where you put these files! The first thing you will see is a Terms of Service Agreement. Make sure to read this clearly and hit "I accept", if you do. Since AA2 is no longer supported, all America's Army Personal Jacket accounts do not exist anymore. Your account/player information, and more is now located at Battletracker. 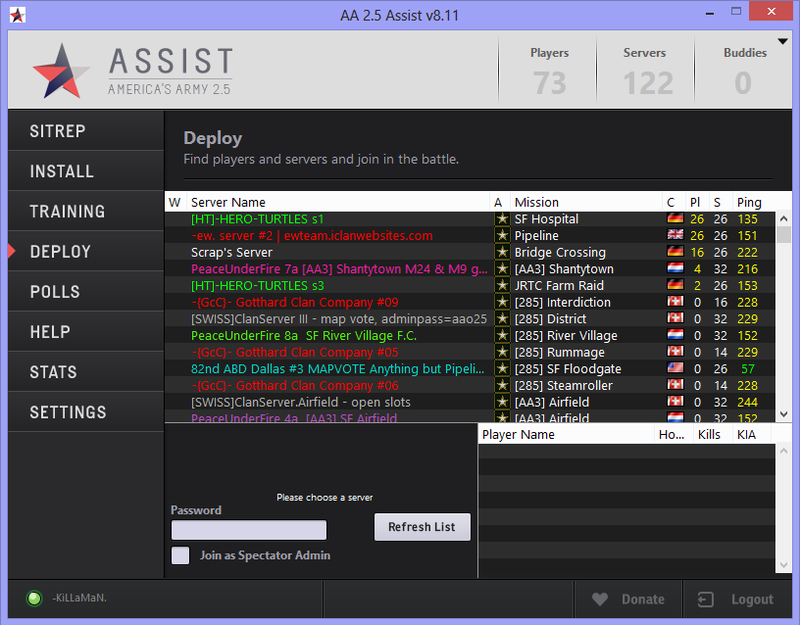 In order to play America's Army through Assist, you will need an account at Battletracker. If you are a new player and do not have an account, register for one. Once you have a Battletracker account, click on the link My Profile at the top of the page. Now click the Tracker Settings tab and enter your desired America's Army username. This is your in-game username. Don't forget to click the submit button at the bottom of the page. Once you get your account information as outlined above, you will login using 2.5Assist. In the Battletracker.com Account Login box, enter your username and password from your Battletracker account and click LOG IN. Your account information will load and Assist will show you that information in the box. Congratulations, you are ready to move on. After you log-in, Assist will do some initial house-keeping so don't click cancel or block Assist while it gets itself ready. If you have a firewall (or antivirus) like me, it might ask you if you want to allow Assist to access the Internet. Of course, allow Assist to access whatever it needs and make sure the firewall/antivirus remembers to allow Assist access in the future. This is important because you never know if Assist will stop working because the firewall/antivirus is blocking it. 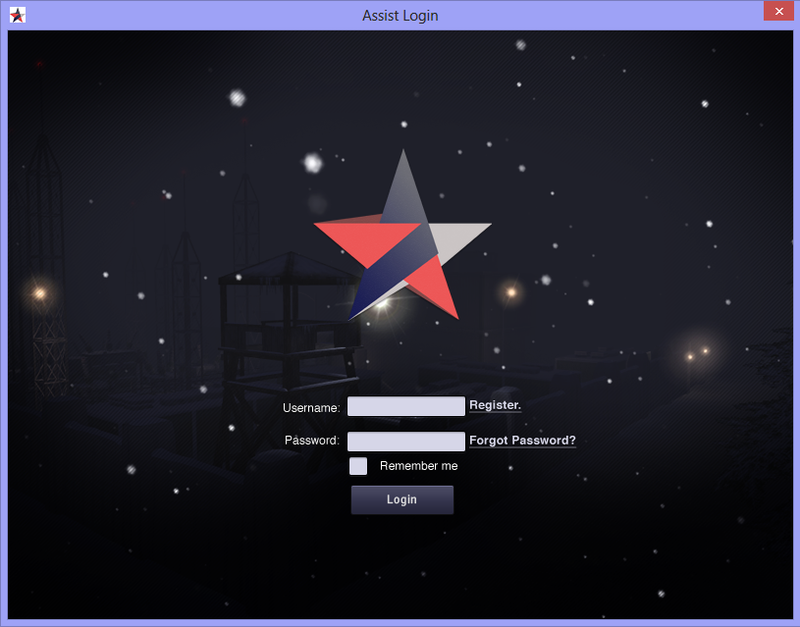 Once Assist has completed some house-keeping, it will ask you about America's Army. 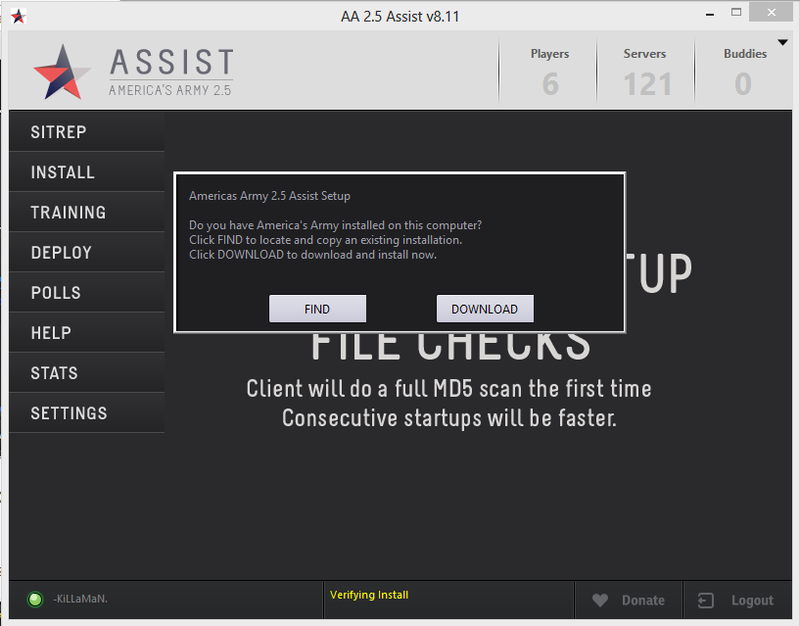 If you DO HAVE America's Army 2.5 installed already, click on FIND to locate it; 2.5Assist will copy that folder to its program folder. Do not click FIND if you have any version besides 2.5 installed. 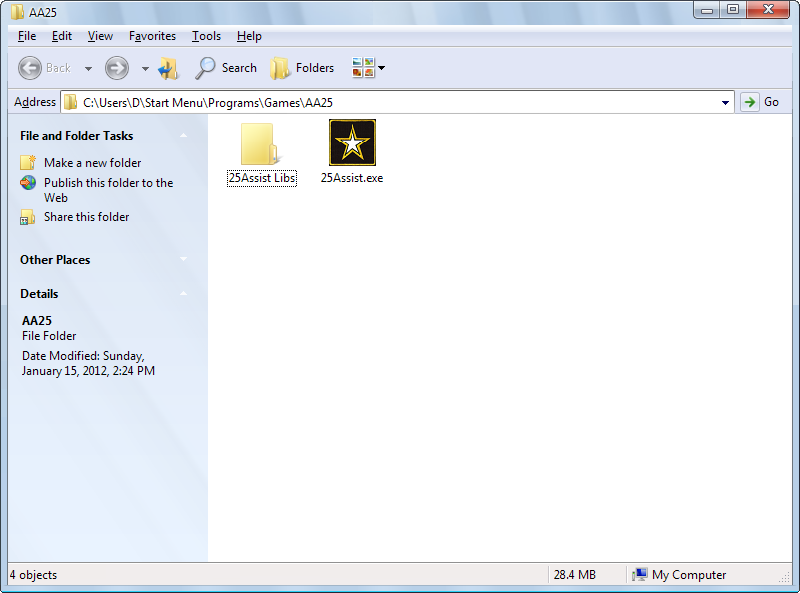 If you DO NOT HAVE an America's Army 2.5 installation, click on DOWNLOAD to download America's Army 2.5. Assist will download and verify each part (i.e., textures, sounds, maps, etc) so users will find relief if they have a spotty Internet connection since Assist can just re-download the part that failed. The stats tab hold all of your current America's Army stats. Where Did My Honor Go? Please remember, we are searching some of this information for you so be patient and give us as much information as possible to make it easier. Settings are changed through Assist by clicking on the SETTINGS tab. There are three categories, Game, Video, and Sound. Settings can still be changed in game as well. That is where your keybinding will have to be done. The quickest way to change your keys/controls is to click the AA SETTINGS button in Assist. 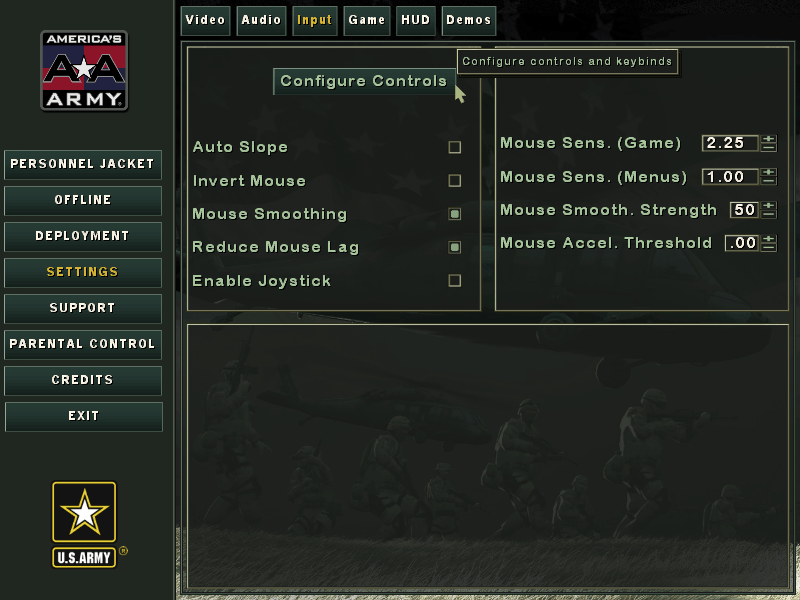 This will open America's Army and allow you to go to the Settings menu where you can change all the options. To change your keys/controls, go to the INPUT tab and click CONFIGURE CONTROLS. After changing settings in America's Army, please close the game. If you would like to add custom keybinds, you can click on the EDIT USER.INI button in the 2.5Assist SETTINGS tab. The user.ini file will then open. Training is no longer necessary as of August 8th 2014. It was previously enabled to retain an authentic feeling to the game. However, our statistics show that the majority of new users did not complete the training required to play. It has been disabled until further notice to allow growth in our community. Training is optional and you may complete it at any time but it will not affect online gameplay in any way. Click on the DEPLOY tab in Assist to bring up a list of all servers. Clicking on the column names will sort the list by that column. Click on a server to view more information. Click the JOIN GAME button to join the server. If the server is password protected, you can enter the password in the bottom left box. Similarly, if you would like to join as a SPECTATOR ADMIN, enter the password and tick the join as Spectator Admin box. 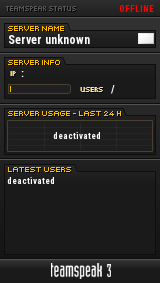 If you're playing America's Army and want to change or join a different server it's very easy. First, quit America's Army (hit ~ and type exit). 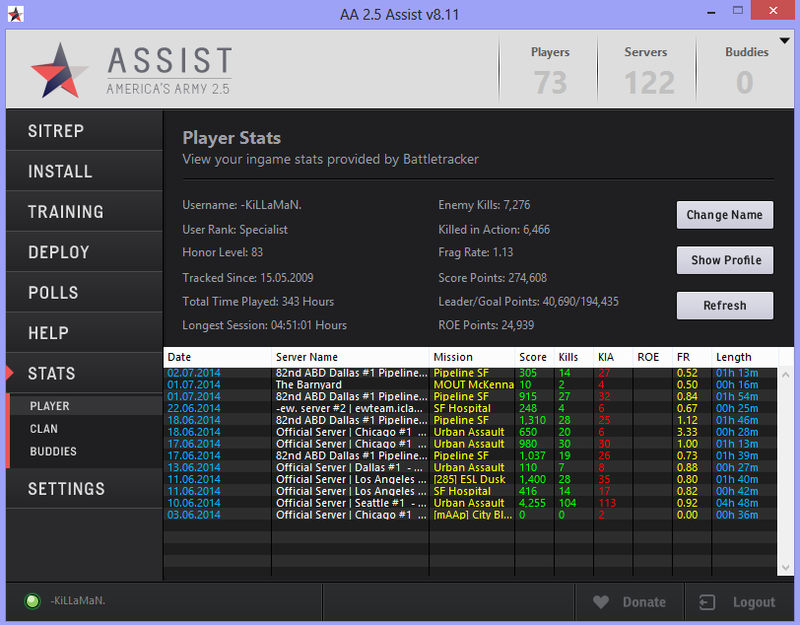 2.5Assist should still be open, so find the server you would like to join by checking the server list. You have mastered Assist. You can ask your questions by visiting the forum where Assist users, administrators, and developers can help you directly there. But please write in a civilized, and mature manner and ask politely.